... 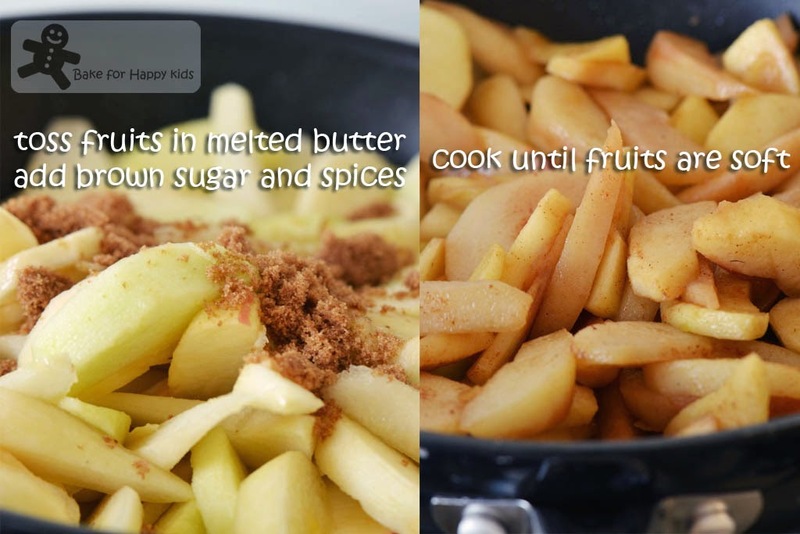 It is generously made with lots of apples, pears and butter! This gorgeous-looking and generous-tasting apple crumble tart is baked using a Gordon Ramsay's recipe. The recipe originally comes from BBC GoodFood but the licence has expired and can't be found in BBC GoodFood anymore. Fortunately, I have printed a copy of this recipe prior to its "disappearance" and managed to bake this beautiful tart. You may also refer to Kitchen Delights who had baked this recipe too. After baking and enjoying it (definitely more than a thin slice... Ops! ), I begin to fully appreciate Gordon Ramsay's style and approach of baking this tart... 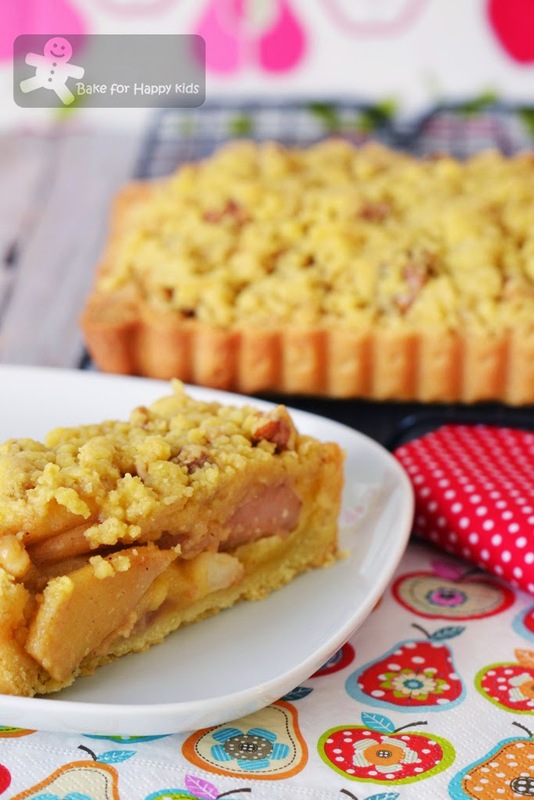 This tart consists of four major components: 1) the sweet pastry 2) the almond frangipane 3) the apple and pear filling 4) the buttery nutty crumble. Each of the component is straightforward, simple and easy to make. Most ideally, each is made with fresh seasonal best quality ingredients. To complete, all I did is to stack all four components together. Easy? 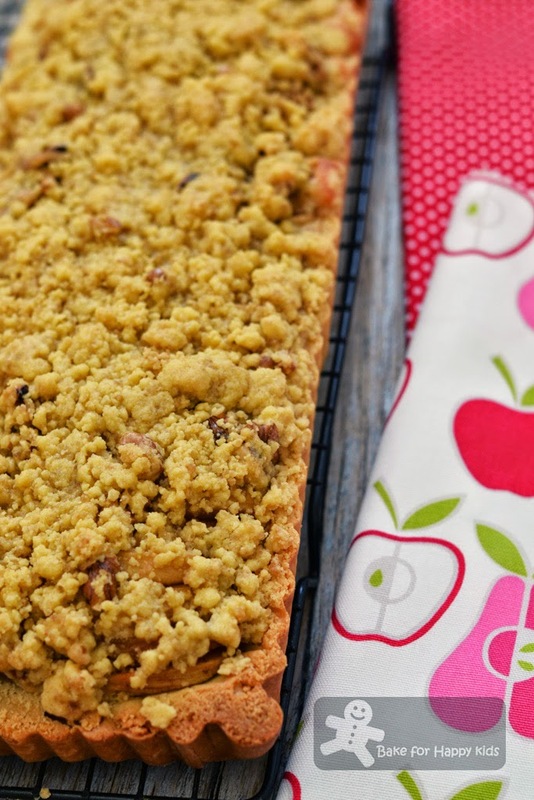 Interestingly, all of these ingredients and components are complimenting each other extremely well... resulting this one perfect apple crumble tart. I like to relate its perfectness being a perfect family with harmony, a perfect couple and kids... Kind of impossible? I believe that a good recipe with a good amount of effort can sometimes make anything impossible possible. Surely, life is chaotic but something can be possible... I like to remind myself, "Stay positive, Zoe! Stay positive!!!" Thanks Gordon Ramsay! I really enjoy your professional way of baking this super generously delicious tart. Now, I really don't mind eating these much butter to enjoy this tart gastronomically. These are all the apples and pears that I used to make this tart. While baking the pastry, cook the apple and pear filling. Add Component Two, the almond frangipane. Next... Component Three, the apple and pear filling. 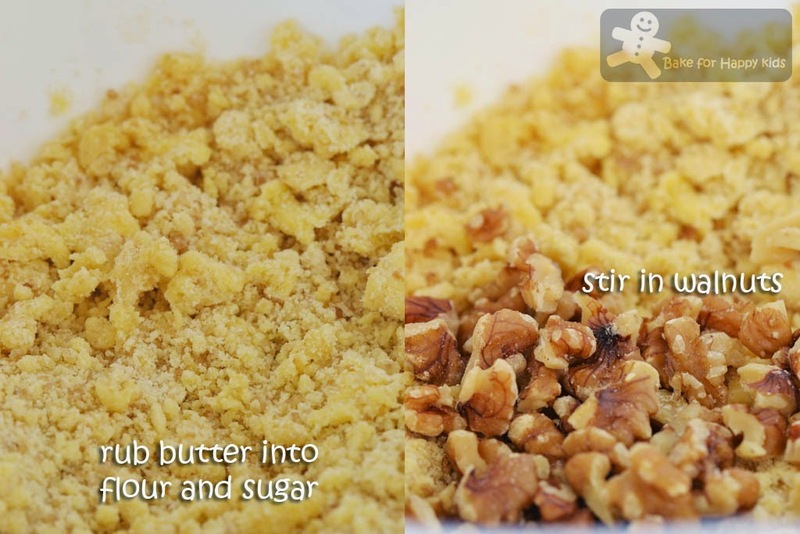 Here is Component Four: the buttery nut crumble. Topping the tart with the crumble mix. Spot the differences! The tart looks the same before and after baking! Can't wait to enjoy a slice of this! Every single bit of this is perfetto! Here's the recipe that I have mostly adapted from BBC GoodFood but the licence of publishing of this recipe has expired. Cream butter and icing sugar together, slowly mix in the egg, flour and ground almonds. Chill for 2 hrs before using. Combine flour, salt and icing sugar in a large bowl. Rub in the butter until it forms breadcrumbs. Briefly beat the whole egg with vanilla seeds. Make a well in the center of the flour mixture and pour in the egg mixture. Combine all until the pastry comes together. Cover and chill for at least 2 hrs. Preheat oven to 180°C (or 160°C fan forced). On a lightly floured surface, roll out pastry to about 5mm thickness. Line one 11 x 34 x 2.5 cm loose-based fluted tart tin or one 22 cm round loose-based round tart tin with the rolled pastry leaving a little excess overhanging the rim. Line the tart case with baking paper and dried or ceramic baking beans and bake blind for 20-25 mins. 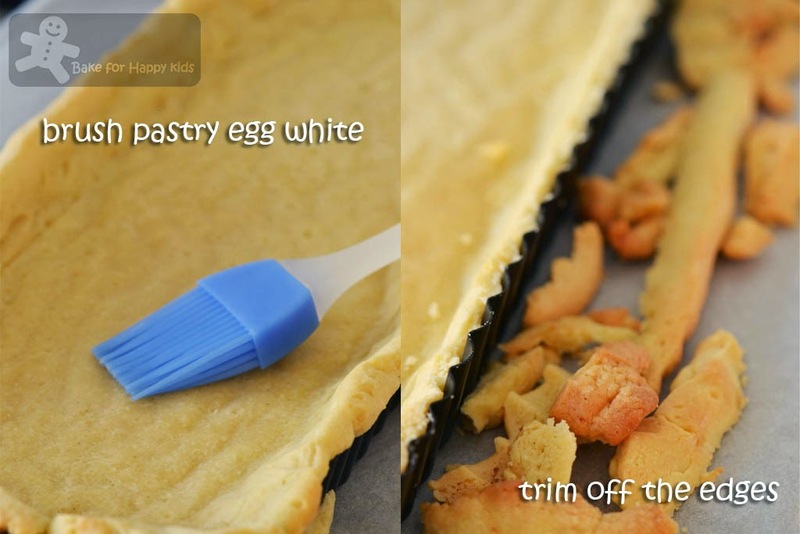 Remove the paper and beans and brush the inside of tart case with egg white. Trim off the excess pastry around the rim and bake again for 5-10 mins. Leave to cool slightly. The original recipe suggests Braeburn but I couldn't find this variety and so I used 2 Granny Smith and 2 Pink Lady. In a frying pan, melt butter until foaming. Add fruit and toss for 30 sec. Add brown sugar and spices. 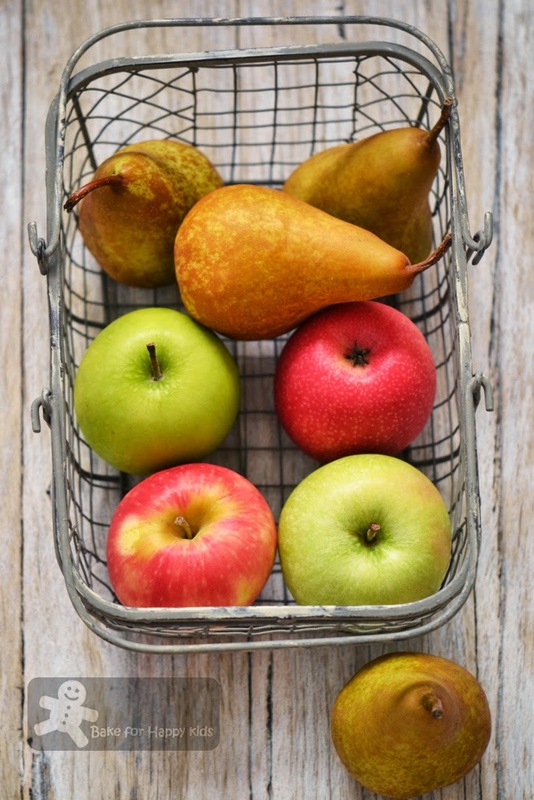 Toss to combine and cook until fruit is soft but not broken down. Rub butter into the flour and stir in demerara sugar and walnuts. 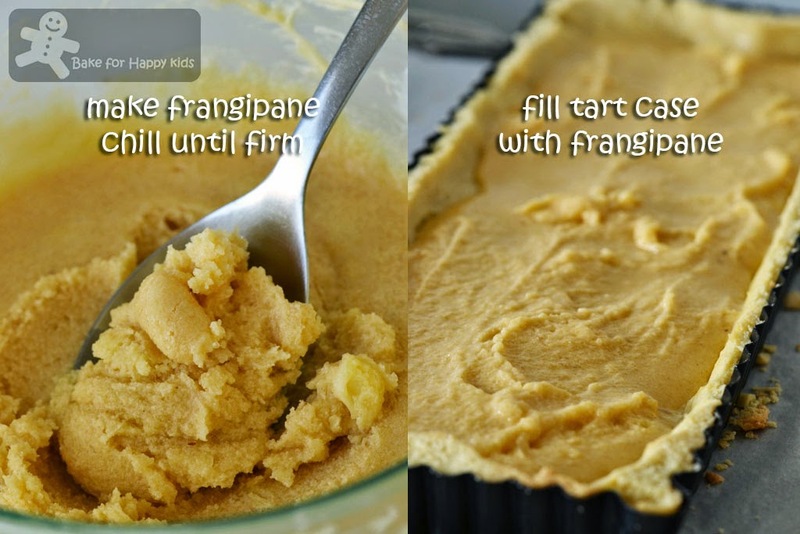 Fill the tart case with the frangipane, then fruit, and top with the crumble mix. Preheat oven to 180°C (or 160°C fan forced). Bake for 30-35 mins or until golden brown. Leave it to cool slightly for 10-15 mins before removing it from the tin. Leave it to cool completely at room temperature. Serve it with cream or custard or on its own. This looks so damn good! I definitely am going to make this! I make a good apple crumble so I can't wait to try this! I love that type of pear! The skin really isn't pretty but the fruit is lovely! 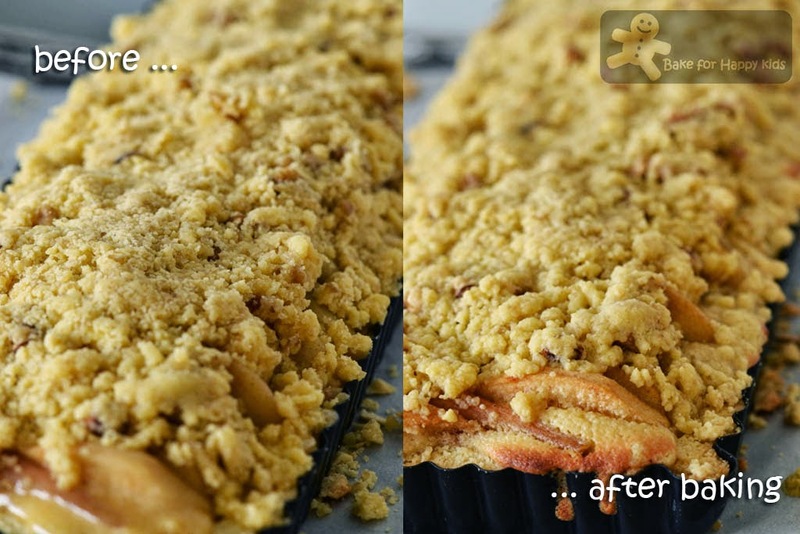 Great recipe Zoe, your crumble tart looks so good! Your apple pear crumble looks so nice.. I've always like apple crumble, but don't bother to learn how to make them.. I always feel they require lots of work.. My elder sister made apple crumble (super) short cut style many years ago.. She crushed digestive biscuits and mixed with some butter, icing sugar and cinnamon, and she says that is crumble.. Haha..
Nice tart, Zoe! It looks really delicious.. I love the crumble topping and it's look really attractive and wanna to have a slice now. Zoe, thanks for shouting out again on Oct LTU event, really appreciate with your great effort, cheers! Omg, this tart is alluring, seriously am just droooling hereeee.. This is a really pretty tart Zoe!! Zoe, I love those chunks of apples & pears ! 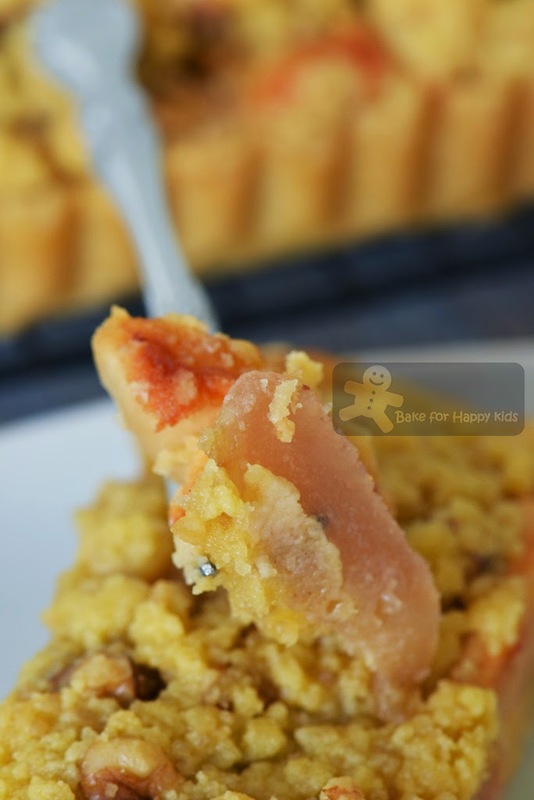 This crumbly tart is so buttery and yummy. Delicious! 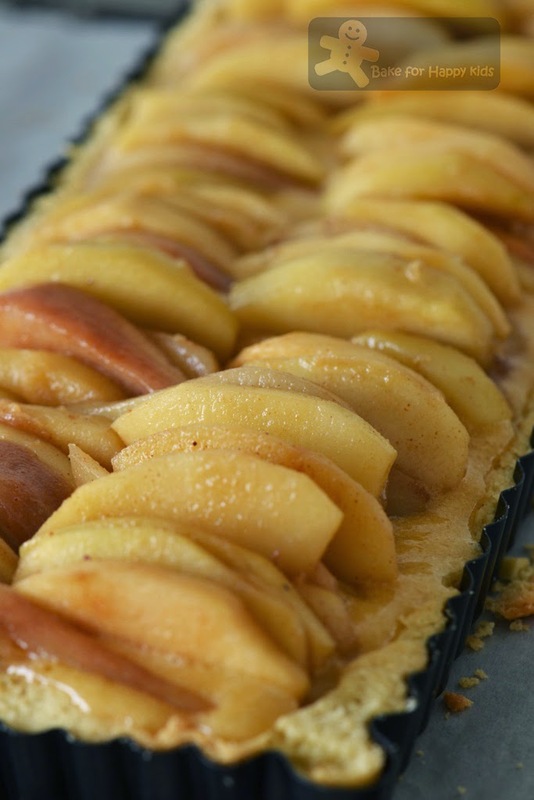 Zoe, this apple tart from Gordon is definitely irresistible and yummy!! I'm sure he'll be so proud of you :) To me, a slice of this warm apple tart would go perfectly well with a scoop of vanilla bean ice-cream, yummy yum yum!! Hi Zoe, hope you'll have a good break in mid October. You are one hard working blogger. This is a glorious looking tart, and you have the recipe to share with us. Thank you! OMG Zoe, I love everything that has frangipane...and the combination of apples and pear just sound delicious! I already saved the recipe...hope to bake this tart soon. yumm!! can I have a slice. Gordon ramsay's recipes are the best !! Thank you for the mention - the tart takes quite a while to make but as your wonderful photographs show, it is worth all of the effort.